To clearly define each section this template uses lines as separators, the bold heading is on the left above each line. Template thirteen shows your contact details first at the top above your name. Below that is your name in a larger bold font. The Experience and Education sections are laid out in a compact manner by placing the date, the name of the business or school and the city on the first line of each entry. Then, comes the position title or degree on the next line. Finally, the details of each entry like duties performed or courses taken that are relevant to the job in question. It is wise to add in any awards or special certificates that are specifically related to the duties of the new job. Remember that it is proper etiquette to put your references on a separate page for which we have a creator. When you finish your resume, building it with our creator, you can easily export your data to our Reference Page Creator. With this additional page you can correctly supply a list of your references. 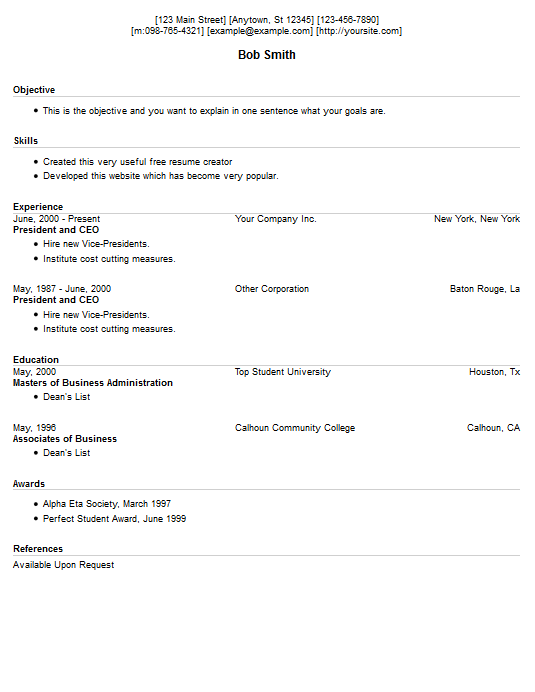 Before you create your reference page, you will need a cover letter. Use our Cover Letter Creator to create a cover letter page next. It is important to have one so you can expand on the important points from your resume. Be sure to follow the procedures of the company you are applying to. Make sure they want a cover letter before you submit one. Make your resume here right now.